Another double success story for two Mid Ulster men who received free training through our Jobmatch programme. Both Charlie and Anthony had a similar story, they both approached us seeking advice and guidance on what to do when they had found themselves unemployed. Anthony from Cookstown wanted to complete forklift training in order to improve his chances of finding a job. He also needed help to compile a CV as he had never had one before and employers were asking for CVs for job vacancies. Charlie from Magherafelt also wanted to complete his forklift licence and needed support updating his CV and completing application forms. 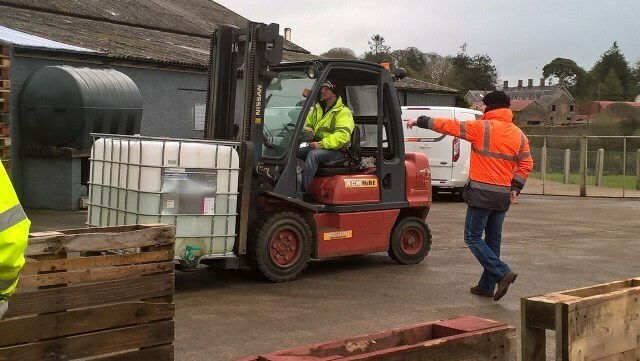 We were able to source forklift training for both Anthony and Charlie with Allingham’s Forklift and Safety Training in Cookstown which they successfully completed. Anthony then worked with his Employment Coach to draft up his CV which included details of his new forklift licence. Once Anthony had a CV he was happy with, he sent it to several local employers and Quinn Building Supplies in Ardboe asked to meet with him. Anthony was delighted when they offered him a full time role. Charlie’s Employment Coach helped him to update his CV and complete sample application forms. When Charlie successfully completed an online application form for a General Operative role with Mid Ulster District Council we helped him prepare for his interview. Charlie was delighted to have been offered the job and is enjoying his new role. We wish both Anthony and Charlie every success in their new roles. There are many options to consider and choose from when searching for a new job. We can provide you with numerous services such as developing CV’s, job applications and various training courses to name a few. If you are interested in finding out what support we can offer, give us a call on 028 7963 1032 or email info@networkpersonnel.org.uk for more information.